Hackamore is the term used to describe bitless bridles. There are several different types of bitless bridles that you can use on your horse, but in order for the bridle to be effective it has to be fitted correctly. An improperly adjusted bridle will be ineffective at best and confusing or painful for your horse in the worst case scenario. Before you can begin fitting a hackamore you need to make sure the headstall you are using is the right side for your horse. Hackamore bridles are sold in all four basic sizes: pony, cob, horse (full) and extra large (oversize, draft). While all bridles are adjustable to some extent, extreme adjustments made to a bridle will cause it to fit badly even when you do get in on your horse's head. Since many hackamores rely on pressure points and leverage in order to function properly, your bridle needs to be the right size for your horse's head even before it is fitted. While all manufacturers have slightly different sizing, your horse should require the same size hackamore as he does regular bridle. Before you purchase a hackamore, contact the manufacturer to get specific measurements or try one on your horse to make sure it fits. The sidepull is a basic type of hackamore that uses pressure without leverage to tell your horse where to go. 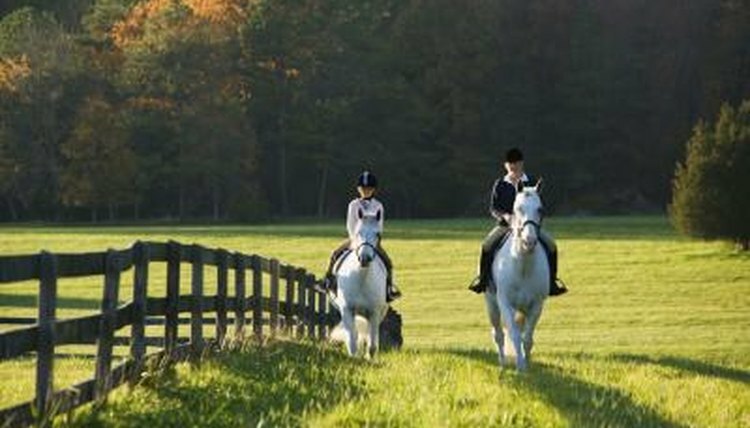 Sidepulls are best used on fairly well trained horses by reasonably experienced riders because they do not offer a lot of stopping or corrective power. A properly fitting side pull will fit much like a traditional English bridle. The headstall should wrap comfortably around your horse's head and the browband should sit on the horse's forehead and not droop or actively pull on the sides of the headstall. You should be able to fit two fingers underneath the browband. When you buckle the throatlatch you should be able to fit four fingers between the bottom of the horse's throat and the throatlatch. The noseband, the most important part of the sidepull, should sit on the nose just below your horse's cheekbones. It should fit snugly but not tightly. You should be able to fit several fingers in between the noseband and the horse when no pressure is being applied. A bosal consists of a rawhide, leather or rope noseband, mecate reins and a headstall. The headstall should fit the same way the sidepull headstall fits, comfortably across the horse's head without pulling. The bosal itself should sit lightly across the bump on your horse's nose, between the nostrils and the bottom of the cheek. The bosal may brush the sides of your horse's face but should not be applying pressure when not being directly used. The underside of the bosal should not be touching your horse's skin or jaw and there should be at least two finger widths between the top of the knot where the mecate ties in and your horse. The mecate are the bosal reins. The mechanical hackamore fits similarly to regular bridles and the side pull except it uses a metal, shanked device in place of a normal bit. Mechanical hackamores should only be used by extremely experienced riders on well-trained horses. Exerting too much pressure with a mechanical hackamore can seriously injure your horse. Chances are, if you do not know how to fit a mechanical hackamore properly, you do not need to be riding in one without the supervision of a professional riding instructor or horse trainer. If it is you first time using a mechanical hackamore your trainer needs to handle showing you how to fit it properly on your horse to avoid injury.